A work containing information on all subjects, or exhaustive of one subject, arranged in systematic, usually alphabetical, order. Such works were not unknown in the Orient. Among Greek and Syriac Christians they were based upon homilies dealing with the six days of Creation. Mohammedan writers developed in course of time a large literature of both general and special encyclopedias, the earliest of which seems to be the "Mafatiḥ al-'Ulum" of Mohammed ibn Aḥmad al-Khawarizmi (975-997). The first Hebrew work of this kind known to us is the mathematical encyclopedia of Abraham bar Ḥiyyah of Barcelona (c. 1150); and it is acknowledged that it was written upon Arabic models. It was entitled "Yesode ha-Tebunah we-Migdol ha-Emunah," and treated of arithmetic, geometry, optics, astronomy, and music; only fragments of it are extant. A century later a more extensive encyclopedia was published by Gershon ben Solomon Catalan of Arles, under the title "Sha'ar ha-Shamayim" (Venice, 1547). It is divided into three parts: (1) physics, meteorology, mineralogy, natural history; (2) astronomy; (3) theology, or metaphysics. Judah ben Solomon ha-Kohen ibn (Toledo, 1247) wrote a similar work, but in Arabic, which he translated into Hebrew ("Midrash ha-Ḥokmah"). It treated of logic, physics, metaphysics, mathematics, and the mystical sciences. As in Mohammedan works, the first three divisions closely followed Aristotle. The "Shebile Emunah" of Meïr ibn Aldabi (fourteenth century) went even further, comprising more of Jewish theology and practical ethics than other works of this class; but it is largely a compilation, especially from the "Sha'ar ha-Shamayim" of Gershon b. Solomon. A Turkish scholar of the sixteenth century, Solomon ben Jacob Almoli, undertook the publication of an encyclopedia under the title "Me'assef le-Kol ha-Maḥanot," but nothing further than the plan and prospectus appeared (Constantinople, 1530-32). Jacob Ẓahalon, rabbi and physician at Ferrara in the seventeenth century, produced an encyclopedia under the title "Oẓar ha-Ḥokmot." It was divided into three volumes, of which only the third, entitled "Oẓar ha-Ḥayyim" (Venice, 1683), and treating of medicine, has been preserved and published. A general encyclopedia was planned by Jair Ḥayyim Bacharach (c. 1650), arranged according to subject-matter. Only one volume, containing the index of subjects, has come down to us. A work of the same kind was published (Venice, 1707-08) by the physician Tobiah of Metz, under the title "Ma'aseh Ṭobiyyah." It also was divided into three parts, dealing with: (1) metaphysics, theology, astronomy, cosmography, elements; (2) medicine; (3) botany and zoology. As was the case with their Arabic proto-types, none of these works was arranged in alphabetical order. The scarcity of secular encyclopedias is compen sated by the abundance of those devoted to Talmudic and Midrashic literature. To these belong the "'Aruk" of Nathan ben Jehiel of Rome (twelfth century), which is as much a Talmudic encyclopedia as a lexicon. The various "Yalḳuṭim," the "'En Ya'aḳob" of Jacob Ḥabib, etc., are rather collections of Talmudic and Midrashic lore. 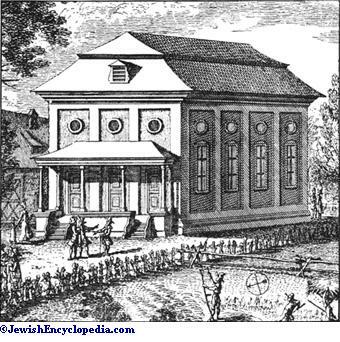 The first complete rabbinical encyclopedia was composed by Isaac Lampronti, rabbi at Ferrara (1679-1757). His "Paḥad Yiẓḥaḳ" is arranged in alphabetical order, and contains a large mass of somewhat undigested material, covering the whole ground of rabbinic literature down to the writer's own day (12 vols., Venice, 1750-1813; the second half was published by the Meḳiẓe Nirdamim Society 1864-88). Similar works, but of lesser importance, covering certain departments only of Talmudic or rabbinic literature, have been published at various periods. Among these is the "Torah we-Ḥayyim" of Ḥayyim Palagi (Salonica, 1846), dealing with the ethical part of the Talmud; the "Nifla'im Ma'aseka" of Abraham Shalom Hai (Leghorn, 1881), embracing the haggadic portions of the Talmud; the "Abbi'ah Ḥidot," by the same author as the preceding (ib. 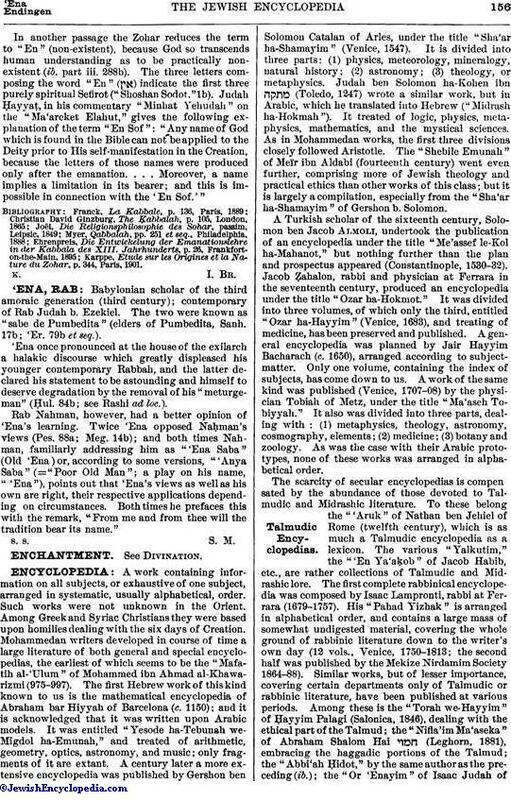 ); the "Or 'Enayim" of Isaac Judah ofKamarna (Kamarna, 1882), an encyclopedia of the Cabala; the "Kerub Mimshaḥ" of Solomon Ḥazzan of Alexandria (Alexandria, 1895), on the haggadic portions of the Talmud. To the nineteenth century belong the first attempts to produce an encyclopedia dealing with Jewish life and literature. In 1840 an essay was made in Russia which was voiced in Jost's "Annalen," and for which the editor promised to set apart a separate column in his journal entitled "Encyclopädie der Theologischen Literarischen Angelegenheiten"; but nothing further came of the attempt ("Annalen," 1840, pp. 161, 236, 276, 378). In 1844 Steinschneider and Cassel planned a comprehensive work of this kind, and issued a "Plan der Real-Encyclopädie des Judenthums Zunächst für die Mitarbeiter" (Krotoschin). Part of this was an article on abbreviations by Steinschneider ("Heb. Bibl." xxi. 103), which was republished in the "Archiv für Stenographie," 1877, Nos. 466, 467, and in "Die Neuzeit," Vienna, 1877 (comp. Steinschneider's "Briefe über eine Encyclopädie der Wissenschaft des Judenthums," in "Orient, Lit." 1843, pp. 465 et seq.). Various articles, originally written for this work, appeared elsewhere; that on "Judensteuer," by Selig (Paulus) Cassel, appeared as "Juden" in Ersch and Gruber's "Allgemeine Encyklopädie der Wissenschaft und Künste" ("J. Q. R." ix. 233); "Aderlassim Talmud," by Alois Brecher, appeared in "Prager Medicinische Wochenschrift," 1876, March 22 and 29 ("Hebr. Bibl." xviii. 94); Beer's "Abraham" was issued as a separate book—"Das Leben Abrahams" (Leipsic, 1859; see "Deutsche Lit. Zeitung," 1893, p. 1320). A few years later S. L. Rapoport projected a Hebrew encyclopedia of Talmudic and rabbinic literature. One volume only appeared, covering the letter "alef" (Prague, 1852), and entitled "Erech Millin, Opus Encyclopedicum. Alphabetico Ordine Dispositum, in Quo et Res et Voces ad Historiam, Geographiam, Archæologiam, Dignitates, Sectas Illustresque Homines Spectantes, Quæ in Utroque Talmude, Tosefta, Targumicis Midraschicisque Libris Occurrunt, Necdum Satis Explicatæ Sunt, Illustrantur." Another encyclopedia in Hebrew, confined to secular science, and grouped according to subject-matter, was undertaken in 1844 by Julius Barasch, but he did not get beyond the first volume, devoted to philosophy. This was entitled "Oẓar ha-Ḥokmot, Liber Thesaurus Scientiæ in Lingua Hebraica Continens Fundamenta Omnium Scientiarum. Sectio Philosophica" (Vienna, 1856). Ezekiel Lewy, rabbi at Beuthen, followed Rapoport, but on a smaller scale, and undertook the publication of an encyclopedia, in Hebrew, of Halakah, Midrash, and Haggadah; but only the alef volume, under the title "Biḳḳoret ha-Talmud," appeared (Vienna, 1863). J. Hamburger, rabbi of Mecklenburg-Strelitz, was the first to successfully publish a Jewish encyclopedia in German, confined, however, to Biblical and Talmudical subjects: "Real-Encyclopädie für Bibel und Talmud," in 2 vols., Leipsic, 1870-84, the first dealing with Biblical, the second with Talmudic, literature. From 1896 to 1901 the author added a third volume, containing six supplementary parts covering a portion of the literature, and the most important writers, of the early Middle Ages. A new title, "Real-Encyclopädie des Judenthums," was given to the whole. Hamburger's work, despite its disjointed character and untrustworthy citations, was a great step in advance, and is praiseworthy as the work of one man. 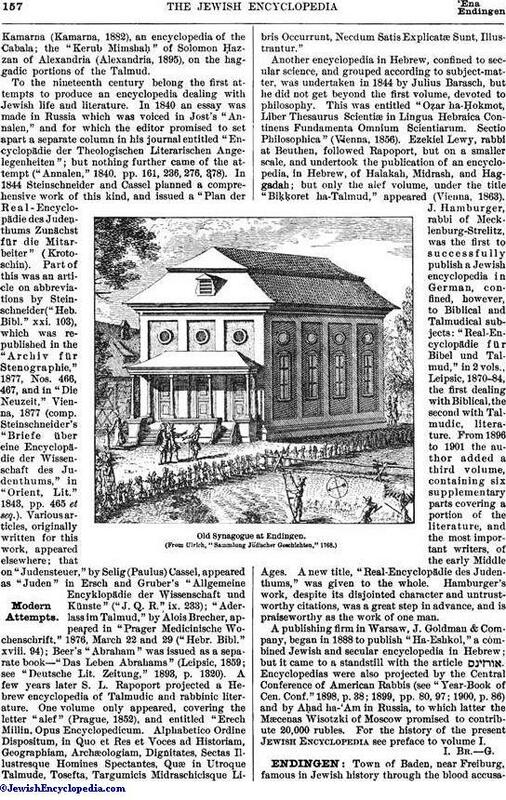 A publishing firm in Warsaw, J. Goldman & Company, began in 1888 to publish "Ha-Eshkol," a combined Jewish and secular encyclopedia in Hebrew; but it came to a standstill with the article . Encyclopedias were also projected by the Central Conference of American Rabbis (see "Year-Book of Cen. Conf." 1898, p. 38; 1899, pp. 80, 97; 1900, p. 86) and by Aḥad ha-'Am in Russia, to which latter the Mæcenas Wisotzki of Moscow promised to contribute 20,000 rubles. For the history of the present Jewish Encyclopedia see preface to volume I.